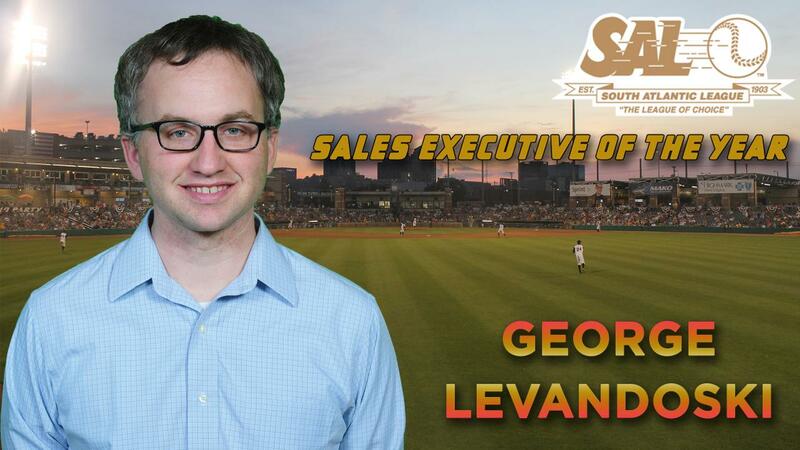 George Levandoski is the South Atlantic League's 2018 Sales Executive of the Year. CHARLESTON, WV (September 4, 2018) - The West Virginia Power, Class A affiliate of the Pittsburgh Pirates, is proud to announce, in conjunction with the South Atlantic League and league president Eric Krupa, that George Levandoski has been named the South Atlantic League's Sales Executive of the Year in 2018. Members of the 14 league teams, field managers and umpires participated in the voting for the SAL Outstanding Achievement Awards in 2018. Levandoski follows a pair of award winners in 2017 for the Power, as then-Box Office Manager Hannah Frenchick took home the Patriot Award and Marcus Commander was honored as the Visiting Clubhouse Manager of the Year a season ago. "I am so honored to receive this award," Levandoski said. "There are so many great teams and individuals in the South Atlantic League, so this recognition means a great deal. I want to thank my sales team for their hard work throughout the season and making this award possible." Throughout the 2018 campaign, Levandoski not only exceeded his personal sales goals and brought in an additional 82% of revenue year-over-year, but also guided his sales staff in accumulating a 28% overall increase in sales from last season. The Maine native additionally brought in more than $80,000 of new business to the Power's client base, which accounted for more than 70% of his sales in 2018. "George got to Charleston and immediately made a positive impact," Power Executive Vice President Ken Fogel said. "His skills are a definite asset to our organization, and I feel lucky that he is working for us." Prior to joining the Power in the spring of 2017, Levandoski spent ten years with the San Antonio Missions of the Double-A Texas League. This season marked Levandoski's 13th year in Minor League Baseball. The University of Illinois at Urbana-Champaign product received his start in MiLB with the Double-A Tennessee Smokies as an intern. A lifelong fan of the Boston Red Sox and New England Patriots, Levandoski has quickly assimilated into the Charleston community and the state of West Virginia. He currently resides with his wife, Ashley, in Charleston.